Two newly-discovered white dwarf stars exhibit extremely odd properties, almost resembling planets. Their dense cores are exposed, shrouded in a layer of oxygen. Are these dying stars potentially habitable? Researchers at the University of Warwick and Kiel University looked over the data from the Sloan Digital Sky Survey (SDSS), and spotted the two white dwarfs with large amounts of oxygen present, both approximately the size of planets. 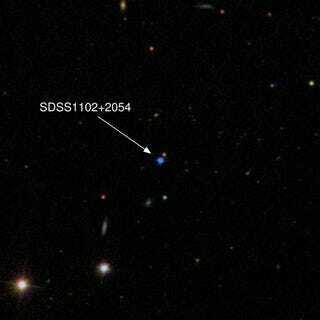 These stars, SDSS 0922+2928 and SDSS 1102+2054 are 400 and 220 light years from us, and may be some of the most massive that can produce this type of white dwarf. How did these stars get into this state? Current theories on the lifecycle of large suns (7-10 times the mass of our Sun), state that eventually they'll consume all their hydrogen, helium and carbon, and then either collapse into a white dwarf with an oxygen-rich core, or go supernova before condensing into a neutron star. However, all the white dwarfs spotted previously have been surrounded by a hydrogen an/or helium layer, which obscures us from seeing their cores. Until now. The current understanding of the process of how these stars are created predicts a carbon-rich layer would surround the core, and prevent the oxygen from making its way outwards. However, the higher the mass of the star, the thinner this layer, so the discovery of two stars with oxygen rich surfaces means they were originally extremely massive stars. They would have had as dense a progenitor star as possible, in order to form a white dwarf. Unfortunately, the data is insufficient to calculate precisely how much mass these stars have, but they're thought to be more than 500 million years old. Luckily, more information on these stars could soon be available. Head researcher Boris Gänsicke wants to try to measure the mass of the suns, which can be derived from their distance. And according to Gänsicke, "once you know the distance of a star, and you know how bright it is, you can calculate its radius, and for white dwarfs there is a theoretically well-understood relation between mass and radius." They also plan to get more detailed spectroscopy, to confirm whether the elements in their cores line up with what's expected. Gänsicke believes that this research is crucial to understanding where the boundary lies between stars that end their lives as white dwarfs, and those that end as neutron stars.